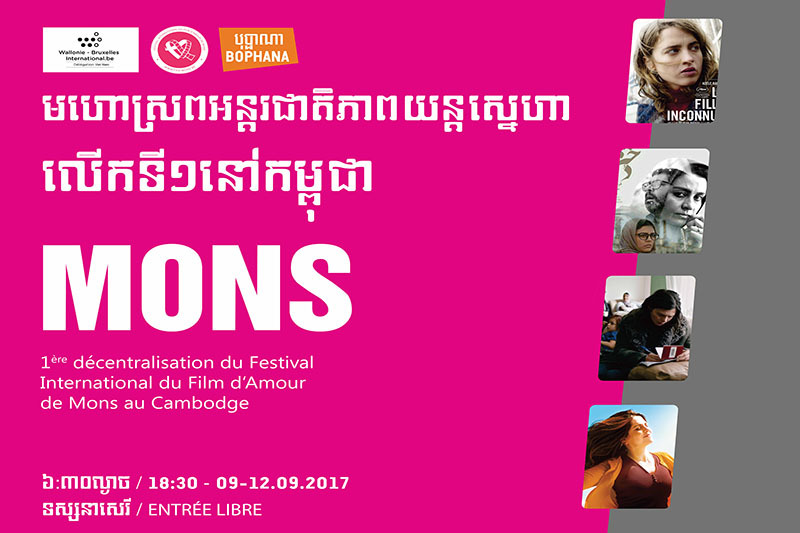 The International Love Film Festival of Mons (FIFA Mons) for the 1st time in Cambodia. The General Delegate of Wallonia-Brussels in Vietnam, accredited to Cambodia and Laos, in collaboration with the General Delegate of the International Love Film Festival of Mons (FIFA Mons) and the Director of the Bophana Audiovisual Resource Center, organizes the 1st Decentralization of this Festival, from September 9 to 12, 2017 at Bophana Center in Phnom Penh. Four films, among the best of the last edition 2017, will be screened, with the presence of the General Delegate of FIFA Mons, Mr. André Ceuterick. FIFA Mons was created in 1984. The festival presents films with the theme of Love in the huge sense. Actually, it enjoys a great reputation and influence in Belgium, Europe and all over the world.